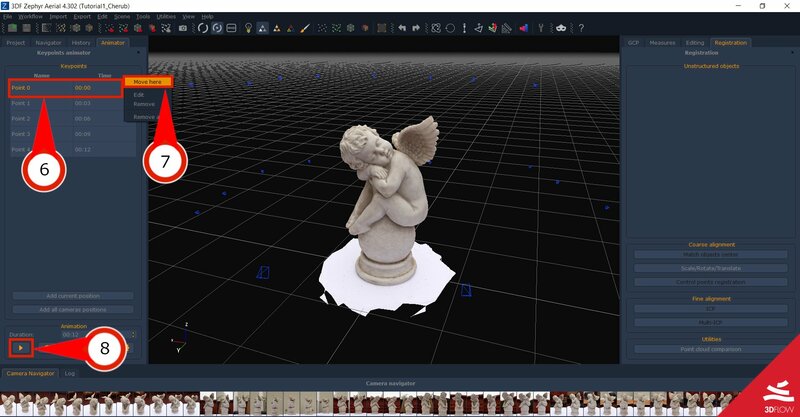 In this recipe, you will learn how to easily create a movie of your reconstruction in 3DF Zephyr. This tutorial can be done also with the evaluation version of 3DF Zephyr that can be downloaded here (except the actual file export phase). 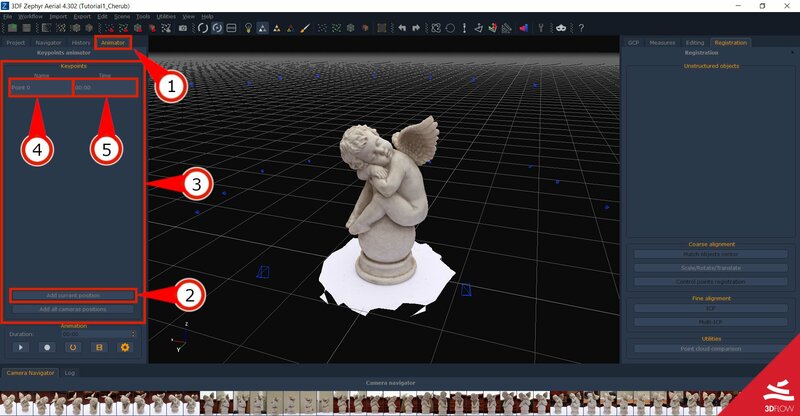 With 3DF Zephyr, you can quickly and easily create a simple animation to show your reconstructed 3D model and export it as a standalone video file that can be played on any computer or uploaded to your online video service of choice. You can use any model you like: in this tutorial we are going to use our familiar cherub from Tutorial #1. 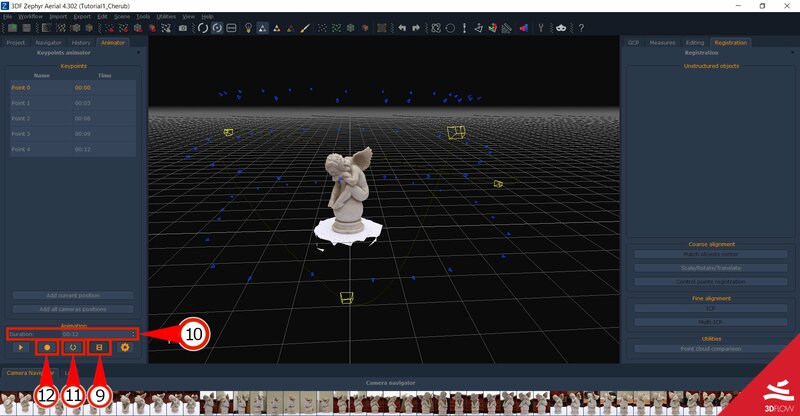 In order to create a movie with 3DF Zephyr Pro, you need to set up a series of keypoints: a keypoint is a location in 3D space, associated to an order and a specific time in your animation. After setting the list of keypoints, Zephyr will automatically interpolate the positions and will create a nice and smooth animation going from the first point to the last one. Navigate the scene to the point where you want your animation to begin: what you see is what you get, so when you are ready to setup your first keypoint, click the “Animator” tab (1). Click on the “Add current Position” button (2) and you will notice a new keypoint will appear in the “keypoint list” (3). As you can see, for each you point there will be listed its name (4) and time (5). You can delete each point (or manually edit those properties) by right-clicking on the keypoint you want to edit. Keep adding points around the reconstructed model. It’s not mandatory to have an animation that can be played in a loop. But what if we want to create one? In order to smoothly loop our animation, we must have the last frame of our animation to be exactly the same as the first one. Righ click on the first keypoint added (6) and in the context menu that will pop up, left click “Move Here” (7). You will be taken to the first keyframe position. Just click again the “Add current Position” button (2) and that’s it! Click on the “Play Animation” button (8) to preview your animation. When you’re happy with the path the cameras are following, proceed to step 4! We’re almost ready to create our movie file. But there a few other tools that can help us tuning the animation timing. You can toggle the “show keyframe” button (9) to view/hide the path of the animation as well as the position of the keyframes (rendered in yellow in the scene). If you are not happy with the speed of the animation, you don’t have to manually set the time for each keypoint: just change the total animation time value in the “Duration” tab (10). You can toggle the “loop” checkbox (11) if you want your animation to stop after the first animation or if you want it to loop indefinitely. When you are happy with your results, just click the “Start Video Recording” Button (12). After clicking the “Start Video Recording” Button (12) you will have the option to set the recording settings. 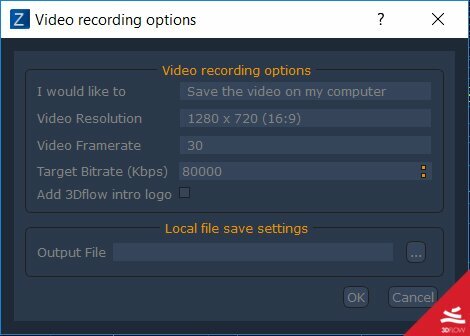 When exporting, you can choose whether to save the movie as .mp4 or .wmv file on your computer, export it directly to Youtube, or both. When clicking the “…” Button you can choose the export file format as well as the filename. The other options are pretty self-explanatory: just pick your desired resolution, framerate and quality settings/bitrate and you’re done! Just click the “OK” button and 3DF Zephyr will create the movie for you and save it to the location you specified. When exporting to youtube, other options will popup that will allow you to set the title, description and tags of your video, as well as the options to save/force a new Google login. Please remember that once the movie is uploaded, it will take a while for youtube to process it! The next tutorial will show how to use input videos instead of images. Click here to proceed to the next tutorial.